I didn’t understand sports as a kid. I knew that they were games, that they had rules and goals, but I had a hard time wrapping my head around the competitive aspects, the celebrity status of the athletes, and what the heck a “down” meant in football. It wasn’t too long before I stood out as the weirdo on the playground without a favorite team, so I bought the trading cards, and I played pick-up games in the street with the neighbor kids. And then my dad signed me up for Little League because that’s what normal dads do when when their kids are playing sports in the middle of the street. For seven years the two of us kept going to these games, never once enjoying it but putting on a brave face and pretending it was the highlight of our week. That’s what we thought we had to do in order to fit in. 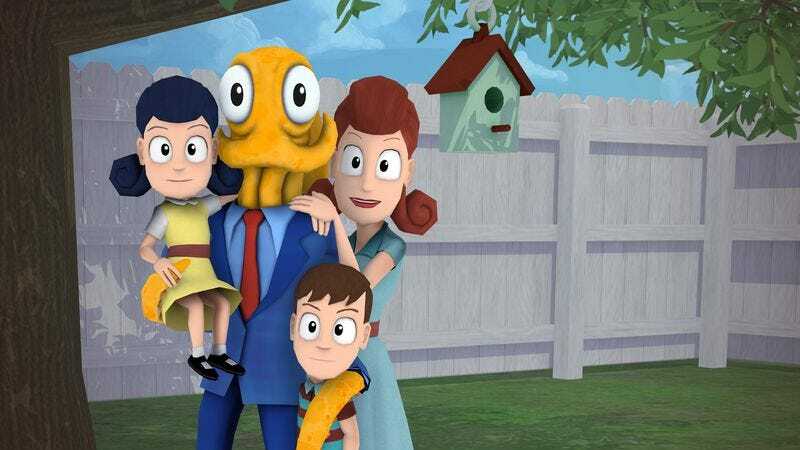 Octodad: Dadliest Catch is all about doing uncomfortable things because that’s what’s expected of you. Your son runs to the top of an elaborate obstacle course, so now you have to drag yourself up there, too. Your daughter wants chocolate milk, so you have to get the last bottle at the supermarket. Your wife wants you to mow the lawn, weed the garden and chop firewood, so all right already, you just do it. Oh yeah, and you’re also an octopus. Maybe I should have mentioned that earlier; it’s kind of important. An octopus decides to dress as an adult human male and start a nice normal human family. Any questions? No? Moving on. The core distinguishing feature of the game is a deliberately obtuse control scheme, where the player moves each tentacle individually, both for movement and interacting with objects like doors, coffee makers, basketballs, and mops. Slow, methodical button taps will allow players to walk in a reasonably straight line, but anything else leads to wild flailing and knocking into just about everything in sight. The act of flopping into a coffee table, combined with the squish-squash sound of an aquatic mollusk blubbering itself back into an “inconspicuous” upright position can be hilarious, but doing so draws unwanted attention, leading anyone close by to doubt your disguise. This is important, because avoiding suspicion is your No. 1 priority. Octodad could best be described as a slapstick stealth fatherhood simulator, though the slapstick aspect is more Tex Avery than Three Stooges. There’s heart to it, an emotional thread that runs deeper than pratfalls and funny faces. Slipping on a banana peel isn’t funny in and of itself. Slipping on a banana peel while walking down the aisle at your own wedding while your fiancée’s friends and family watch, judging your every failed footstep? Now that’s funny in a crushingly personal way. The game stumbles, though, when it focuses more on the “octo” and less on the “dad.” Octodad attempts to create excitement with stealth sections that force the player to avoid being caught by marine biologists, aquatic predators, and an overzealous chef. But these segments lack the heart of, say, plucking the last box of your son’s favorite breakfast cereal from another woman’s shopping cart. Is it a stupid risk, stealing from another person in broad daylight? Yes, but you’re willing to do it for your son. Self-preservation is important, but putting your secret at risk for the sake of your family—who just want to lead a normal life and are utterly oblivious to your own concerns—carries a whole lot more weight. As I played Octodad, I wondered how many times my father did this for me. How many late shifts did he work? How many favors did he call just to get me that saxophone I only played for a couple years? What uncomfortable positions will my kids put me in someday, and what sacrifices will I make, and will they ever appreciate it? Will they like sports, and will I have to cancel my season tickets to the theater to watch the game with them every Sunday? Will I mind, or will it be great because they’re my kids? These are the questions Octodad asks between pratfalls and groan-worthy puns. I don’t have all the answers yet, but at least I have a newfound appreciation for the convenience of simply not being an octopus.